ATOM is a Florida college licensed by the FL Commission for Independent Education to confer the Bachelor’s Degree in Health Sciences, the Master’s Degree in Oriental Medicine and the Doctor of Acupuncture and Oriental Medicine degree. For additional information, contact the Commission for Independent Education (CIE), Florida Department of Education, at 325 W. Gaines ST, #1414, Tallahassee, Florida 32399, toll free 1-888-224-6684. 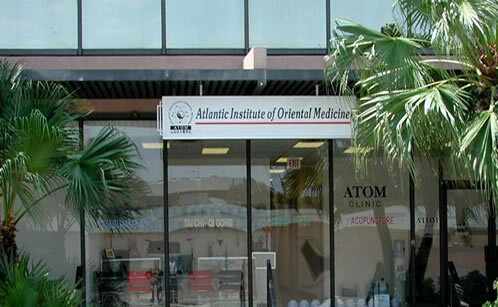 The professional Master of Oriental Medicine Program and Doctor of Acupuncture & Oriental Medicine (DAOM) programs of the Atlantic Institute of Oriental Medicine are accredited by the Accreditation Commission for Acupuncture and Oriental Medicine (ACAOM), which is the accrediting agency recognized by the US Department of Education for the approval of programs preparing acupuncture and Oriental medicine practitioners. ACAOM is located at 8941 Aztec Drive, Eden Prairie, MN 55347. Telephone: 952-212-2434 952-212-2434. Fax: 952-657-7068. Pursuant to Florida State Acupuncture regulations, applicants who apply for licensure as an Acupuncturist on or after August 1, 2001 must have completed a core curriculum comparable to that required by the Accreditation Commission of Acupuncture and Oriental Medicine (ACAOM) master’s level program in Oriental medicine with a minimum of 2700 hours of supervised instruction. All graduates of the Master’s of Oriental Medicine program are eligible to take the certification exams in Acupuncture, Chinese Herbology, Biomedicine and Foundations of Oriental Medicine administered by the National Certification Commission of Acupuncture & Oriental Medicine (NCCAOM). Most state acupuncture licensure boards require passage of NCCAOM’s exams or NCCAOM certification as a pre-requisite for licensure to practice acupuncture/Oriental medicine. For more information, contact the NCCAOM at: 76South Laura Street, Suite 1290, Jacksonville, FL 32202. Telephone: (904) 598-1005. Website: www.nccaom.org.